Includes the names: VernonJMcGee, Vernon McGee, Vernon Ncgee, J McGee Vernon, J. Venon Mcgee, Mcgee Vernon J., G. Vernon McGee, J. Vernon McGee, John Vernon McGee, Dr. J. Vernon McGee ... (see complete list), Dr. J. Vernon McGee, Dr. J. Vernon McGee, Dr. J. Vernon McGee, Th.D. J. Vernon McGee, J. Vernon McGee McGee, J. Vernon McGee TH.D., Th. D. J. Vernon McGee, Editor: J. Vernon McGee, LL.D. J. Vernon Th.D. McGee, Th.D. J. Vernon McGee, LL.D. Known best for his "Thru the Bible" radio broadcasts. He served as pastor of the Church of the Open Door in Los Angeles for 21 years. J. Vernon McGee is currently considered a "single author." If one or more works are by a distinct, homonymous authors, go ahead and split the author. 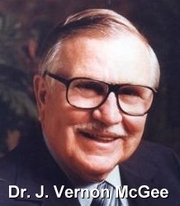 J. Vernon McGee is composed of 23 names. You can examine and separate out names.